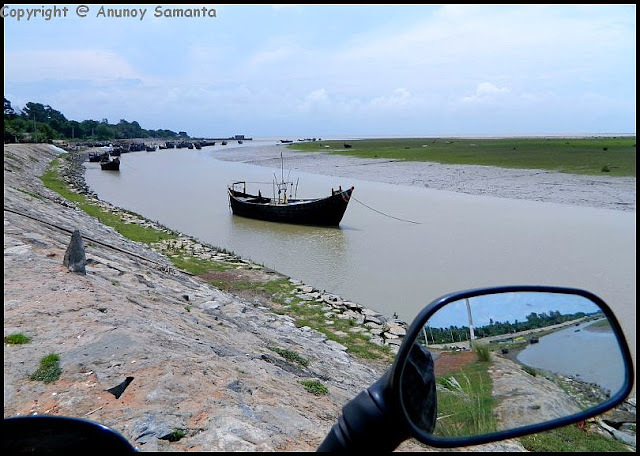 This is continuation of the third post on my motorcycling affair along the Bay of Bengal and here we'll resume the story from where we left Gangasagar after our morning tea. In no time we cruised back to Kachuberia jetty and instantly got the waiting vessel… I was quite used to pulling my pony up and down a boat by then so it was just another event. Another half an hour journey over the Ganges took us back to mainland jetty and some quick riding helped us to reach Diamond harbor by noon. It was perfect time and place for finishing our lunch episode and I did it in style with local prawn dish! It was damn cheap… I wished it was canned prawn which I could take back to my home. 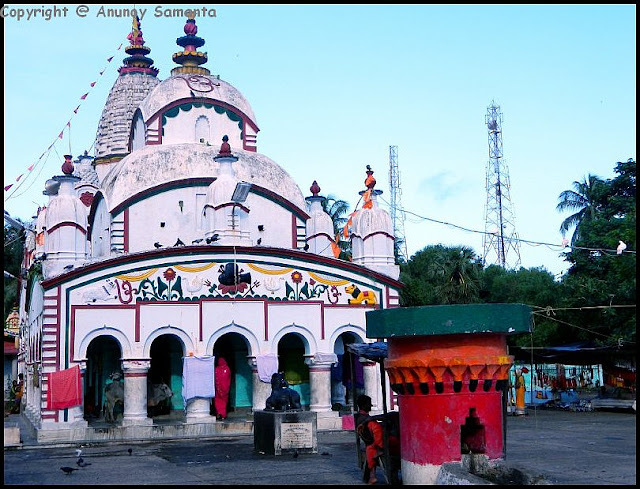 Then we took the road to Raichak where we crossed the Hooghly River ferrying my pony for the last time in our trip, leaving the district South 24 Parganas to reach Kukrahati of East Medinipur. The journey went almost uneventful after that leaving aside the pain at my back (only a true rider knows its precise location and intensity)… we crossed places like Chaitanyapur, Nandakumar, Contai (always pronounce as Kanthi before locals if you want to get the proper direction) etc to reach Digha only after sunset. The coastal town seemed to have developed much since I traveled there six years back… streets looked smoother, wider and shining due to properly arrayed lamps on both side of the main road all along its entire length… It clearly marked the small town’s status as a tourist hub (Bengal’s Goa?) and demarcated its ambiance from the previous coastal places I had rode in my ongoing trip. I had already talked with a hotel last evening by phone, so there was no headache of searching one (In most of the cases I avoid that headache by contacting a hotel in advance)… directly headed to New Digha and checked in Suman’s Hotel. The wheeler selling fish fries were in abundance and I settled for one with fewer crowds. 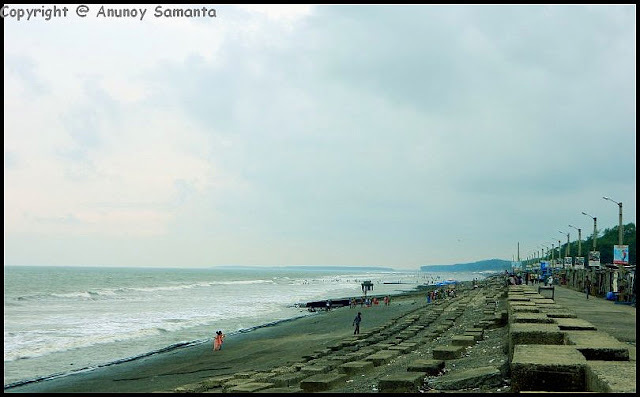 Obviously we were tired even after a quick shower… negated the counsel of hotel owner of walking along the beach footpath to reach Old Digha beach from the New one… simply took our motorbike to the adjacent beach and occupied a place amidst thousand lovers of the sea. I have heard people complaining of the congested beaches of Digha and speaking sweet words for Bakkhali. Well, every tourist has his perspective and liking… it’s rude to comment on that… what I can say is, I enjoyed the transition from the sea of tranquility to the sea of exuberance. If Digha is your American wife, Bakkhali ought to be the tinsel town beauty whom your mother had chosen as your future wife… yea, I know it is a bit funny, rather vague/stupid metaphor but I couldn’t come up with a better one instantly. Smelling the fragrance of honeymooning couples and sweat of experienced lots, while listening to my favorite play-list proved to be a fine pastime. 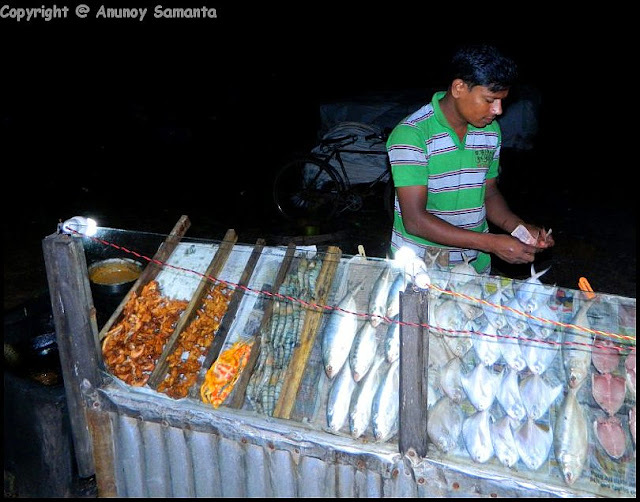 From some corner of the sandy area under yellow halogen came a whiff of mouth watering fresh fish fries… I had to find the source. The wheeler selling fish fries were in abundance and I settled for one with fewer crowds. My brother wanted me to taste a crab but I didn’t know how to eat it out of its shell… Bhetki (Oh its good name is Barramundi!) fish seemed decent for a try in the public place… the hard fried piece was truly scrumptious and the oil content in it delayed my dinner hour. While returning from the beach we noticed the off-season drought in the business of local restaurants and all had a staff of them outside to advertise their specialty and pull the guest in by acting like a local radio channel. We knew all of these, so entered one named Agniseekha and our intuition didn’t deceive us … the thali was quite palatable and next night when I tried their chicken Biryani it was even better! Busy fishermen at Talasari fishing depot. But the idea of ending the day without giving a peep to the Old Digha beach started hurting my throat like a sore tonsil… what could I do?... a quick ride to the old beach… replenishing our stock of mineral water for coming two days on the way… etc before we quited the day… You must be thinking why I didn’t bother to describe the Old Digha beach? Oh never mind, I was too tired by then to watch it from an energetic traveler’s angle… so kept the surveillance part pending for the following day. Morning seven O’clock and we were out of our hotel premises… it was a sunny day! Before any regret of not ‘getting up in the eerie hours and running to beach with the camera’ could knock my free riding mind I justified myself- sunny sky on 7 AM doesn’t corroborate with its similarly cloudless status before daybreak. Oh it was getting more and more pleasant cruising through the beautiful road with light traffic heading towards our neighbor state Odisha (pardon me… I still prefer calling it Orissa). Crossing the state border and entering Baleswar district, our first stop was before Chandaneswar Temple. We weren’t really prepared for the smartness of those temple guys (staffs and priests) residing there and realized it only after they had casted their canning spell! OK let me narrate… the very instant we entered the temple complex a man occupying a desk (ornamented with donation book on it!) at our right detained us for some bucks. I was not at all unhappy to be of some help… after all, they need money to run the religious affairs for us as well as for themselves. Just after he gave me the donation slip he called up a young priest from nowhere and told him to guide us into the main temple. Oh my God, it meant we had paid for a Puja package as well… not a bad deal (eh ‘deal’ sounds mean inside a temple?). The tall young priest in clear Bengali asked us to get ourselves washed in the temple pond at the right side. The mini session of Puja started before the covert Shivalinga. Neither I was comfortable with Sanskrit nor was I religious enough to get into the habit of repeating priest’s uttered Mantras during rituals, so I was literally fumbling which our priest pretended to overlook. “No that was simple donation for the maintenance but this is the part of this holy process” he replied calmly. I got that there was no point in argument and spoiling my mood… I also realized that it was not the Puja Package I was gifted for those bucks… I was cleverly diverted for this and as I was trapped by then, I had too options… either to walk out of the temple without any second talk leaving back all ongoing acts of sanctity or to resume the Puja. I took out a small note from my purse and gave it to the priest as ‘Bedi-Daan’. “This amount won’t do… it’s not acceptable” he denied shamelessly. “Does Lord look for devotion in His children or their potential to donate?” I was adamant but polite. “No please try to understand, donate some more to make it a bigger note… it’s very sacred... it’s the norm…” he continued his illogical but stern justifications. I was in a ‘never back down’ mood by then but my brother signaled me to finish up the nuisance. I fulfilled the demand unwillingly. After the Puja, as we came out of the main temple, the priest recited of the high devoutness of the place… how the Lord broke out from the wood of a Sandal (Chandan) tree… how hundreds of people from faraway surrender them on the feet of the Lord with their varied problems etc. Then he asked for his fee for the ritual he performed for us! Well I better not extend the story of my repugnance… I came out of Chandaneswar Temple too apathetic even to show some compassion to the beggars outside the gate. Our next destination was Talasari beach. Again there were stacks of fishes to be seen… fishes segregated by their types, were being auctioned in bulk. The place seemed to be dipped in the wine of business than tourism in the morning air. There was a boat taking ten-twelve people at a time to the beach which had been separated from the mainland by the rise of water level in monsoon, giving the Talasari beach an appearance of an island. The boat service looked erratic… the tea maker who served us breakfast in a stall told tourists usually reach the beach to find red crabs in abundance. But I had seen as well as photographed (played hide & seek too!) a lot of red crabs already in my trip, so preferred to ride for my next destination Bhusandeswar Temple leaving back the confluence of River Subarnarekha and River (or is it rivulet?) Sakha at Talasari. 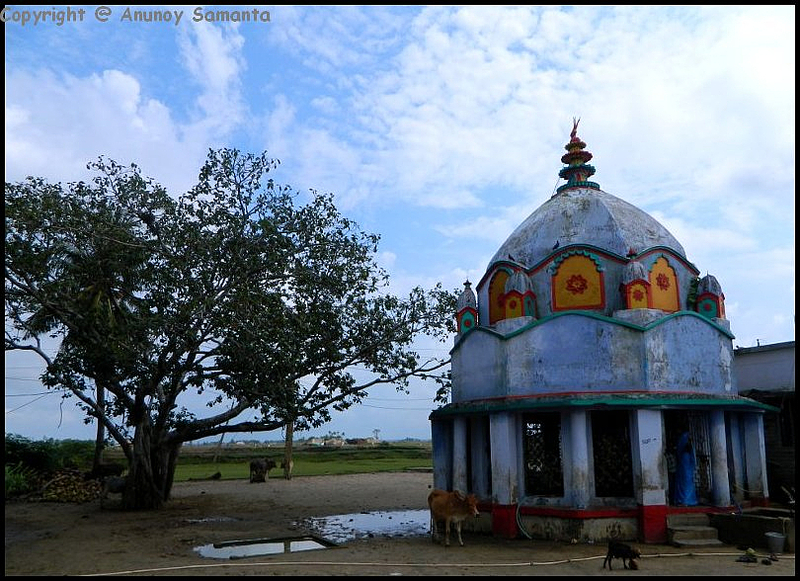 The road got narrower, meandering through picturesque villages, by the side of canals, fisherman localities and finally River Subarnarekha appeared in our frame in less than an hour as we could see the Bhusandeswar Temple from a distance. The enormous Shivalinga inside was clearly visible from outside, moreover I was hesitating to enter the temple owing to my morning experience, so brother joined the other devotees inside the temple while I rested on a wooden platform outside ignoring the lanky ox interfering with my effort. Later brother had told me priests weren’t money minded there but it was OK for me outside. I bowed down once again before the Lord of the universe and restarted our return journey for Digha. On the way back we got down by the bank of river Subarnarekha to watch busy anglers managing three-four fishing rods each. We headed for Udaipur beach which is also in Odisha. There came the golden opportunity… a lottery for any avid biker/traveler… an offer I was hungry for… and the fortune that helped us shortening our trip by a day without missing anything! Udaipur beach had hard wet sand and tourists are permitted to enter the beach with their vehicle. The road got narrower, meandering through picturesque villages, by the side of canals and fisherman localities. We rode over the wet sand letting the modest waves to kiss my pony’s wheels… initially we’re a bit vigilant of the hardness of the ground but as we kept going our confidence over the beach rose high and we kept riding to one end to the other of the Udaipur beach till we belched by the overeating of beach-riding. Even we could ride up to the Talasari beach if there hadn’t been some extra accumulation of water making the path inaccessible to vehicles. 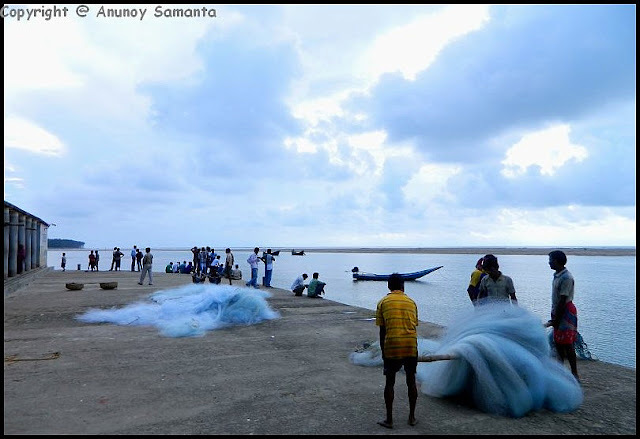 Then we left the pleasant part of rural Odisha and came back to Digha. 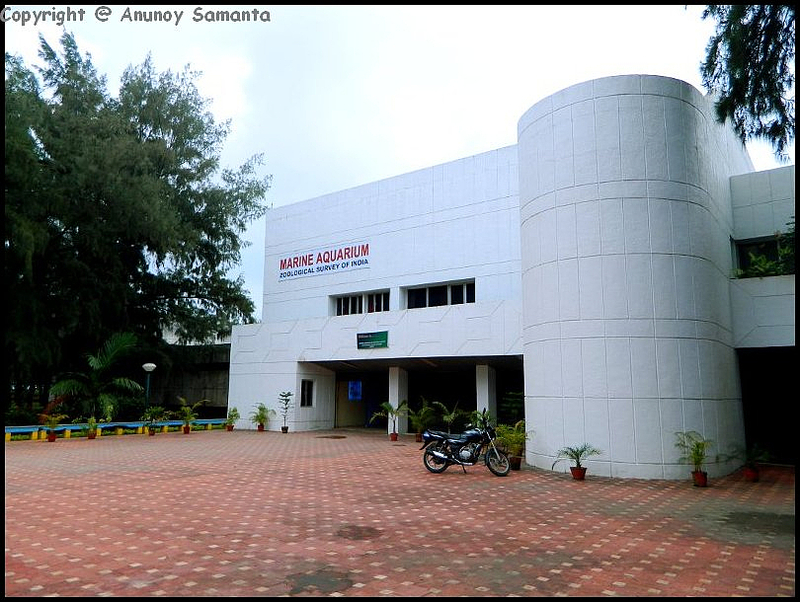 Marine Aquarium was a worthy visit… I wished I had some more affinity for aquatic life. We were the only visitors in the entire hall. Seeing the camera bag hanging down my shoulder the security person came up from his seat of comfort and politely reminded me of ‘Photography is prohibited’ rule… Huh I knew it… I mean read it outside. After our visit he spread out his guest-book before me and I too performed the formality, ‘everything is cool out here’. We had our lunch at Purbasa Hotel where we had the same couple of times in our last visit to Digha and as per my expectation Thali was good. The craving for the afternoon snooze had been enhanced by the intake of rice but I had already canceled our next day’s plan of going to Mandarmoni for enjoying beach-ride after taking the advantage of liberal Udaipur beach, i.e. 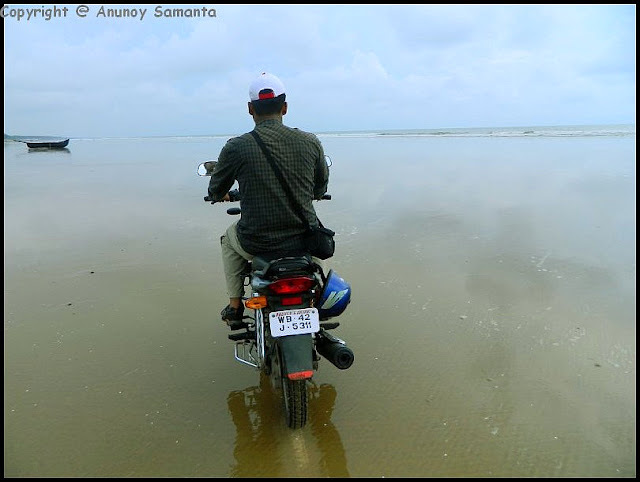 this officially became our last day at Digha… so, returning to hotel room without knowing how Old Digha beach smiles widely under the sun definitely could be a crime… I was afraid to be a sinner… rode to the beach. Shops on the way to the beach were all closed (don’t know why)… few tourists were scattered providing reasonable space to one another… I sat on the concrete slope watching the furious waves hurling, curling and battering the stones/slabs on the shore… unknowingly I got drowsy by the rhythmic wave formation on the sea and the pleasant wind. Sparsely populated Old Digha Beach smiling widely under the afternoon sun. One of my favorite places in India . I visited Bengal last year during the festival of Dussehra. I love their culture and beliefs. They offer prayers to maa durga and many other Hindu gods like Hanuman and also chant his famous mantra hanuman chalisa lyrics every day. I also love the Bengal Sweets, They are the number one in India.